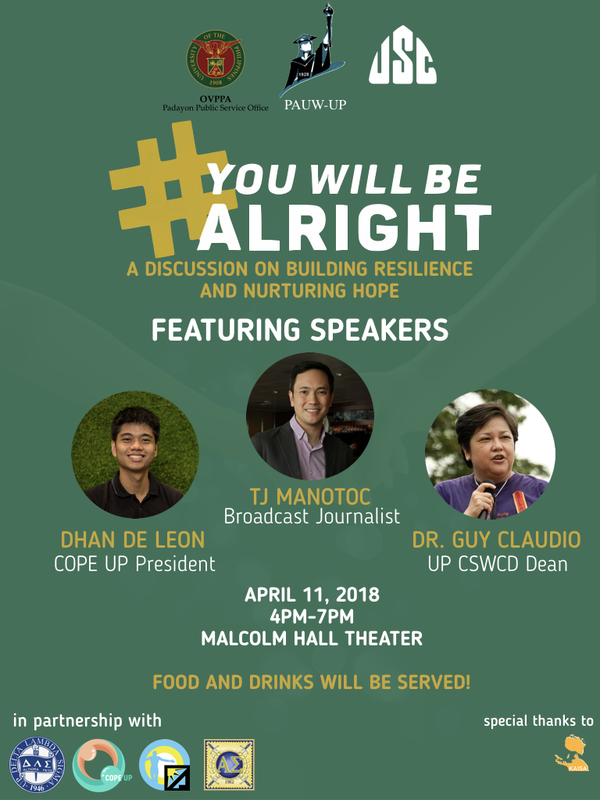 Come and share in stories of hope, healing, and courage this coming April 11, 2018 at the Malcolm Hall Theater at #YouWillBeAlRight: Building Resilience and Nurturing Hope, a forum and discussion featuring TJ Manotoc, Dr. Guy Claudio, and Dhan De Leon! Registration starts at 4pm and food and drinks will be served. This event is proudly presented by the Philippine Association of University Women UP Chapter, UP Padayon, and the University Student Council in partnership with UP Delta Lambda Sigma Sorority, COPE UP, UP ALYANSA, and UP Alpha Sigma Fraternity, and endorsed by the Office of the Chancellor.